Don’t let the time discourage you, but do read through carefully and plan accordingly! Let me start by saying this is one the things I am proudest of baking, entirely from scratch! Although I’m very busy, I find that it’s being busy with a whole variety of activities many of which are organized to keep everyone up here sane through the long, dark, and cold winter. People are very creative in the North, since there are few opportunities for leisure outside of the realm of your imagination. In the fall we took on the challenge of making our own sourdough starter. 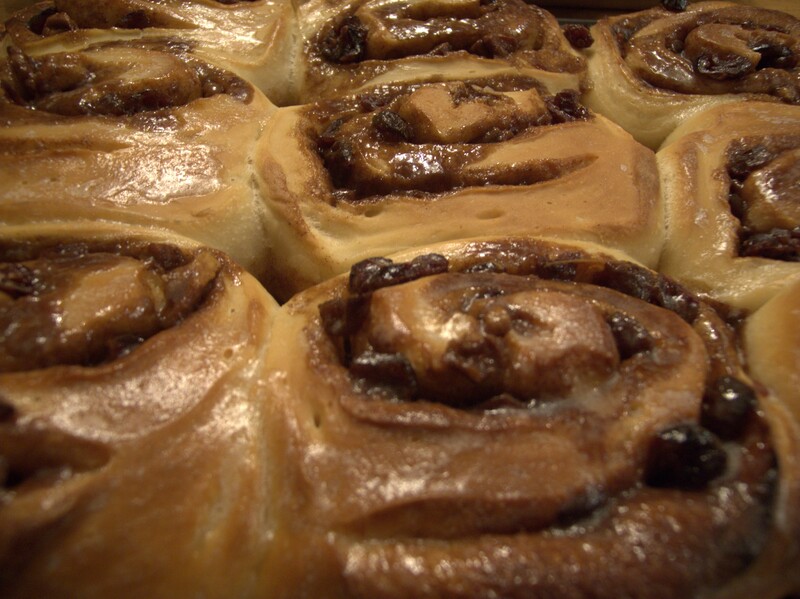 This week, we took on 36-hour sourdough cinnamon buns as a fun challenge. On one of the coldest mornings in Hay River, I realized we had the rare chance of being home enough over the next two days to give these 36-hout cinnamon buns a try. As the recipe starts with a warning that these are very time-consuming (and coming from an author-chef who makes her own phyllo pastry) I was a bit worried because my time did have a finite limit (going to see Les Miserables) the following evening at 7pm. I had to try it, though, as this was my only window in the foreseeable future. Inspired by the northern climate, I decided to add some creativity to this dessert with pecans, and exchange cranberries for raisins as they are more of a local product. The result was dangerously tasty. Day 1, AM: feed the starter the flour and water. Cover loosely and let rest. Day 1, PM: add to starter: flour and water. Cover loosely and allow to sit in a warm place overnight. Day 2, AM: Allow the butter, eggs and buttermilk to warm to room temperature. Cream the butter and sugar for 3-4 minutes, and then add one egg at a time. Finally, add the buttermilk and mix well. After this, I added the starter, and mixed in 2/3-3/4 of the flour. I added a little more flour over time, until you have incorporated it fully, and proceeded to knead for about 10 minutes. After that, let the dough rest covered with a damp tea towel for 20 minutes. Add the salt gradually, and continue kneading for another 8 minutes until the dough feels very uniform. I recommend to keep the surface on which you’re working and your hands nice and floury while you work. Place the dough in an oiled bowl, and mix it around so it is fully covered in oil. Cover with a damp cloth and allow to rise in a warm place until it’s doubled in volume – for me it took around 6 hours, but it can take usually between 4-8 hours. While the dough is rising, melt the butter over medium-low, and watch it bubble until the bubbles get very small and the colour changes from a white to a faint golden colour. Remove from heat immediately. Add the remaining ingredients, return to heat, and cook for a few minutes over medium heat. Cool and beat the mixture until it is a good consistency for spreading. Once the dough has reached twice its original volume, punch it down and roll it out to a large rectangle between two pieces of slightly floured parchment paper. Remove the top parchment paper, and spread and push the filling evenly into the dough, leaving about 2 cm around the edge. Roll it up lengthwise tightly, and pinch the edges closed. Slice it into 16 rolls, and place into a baking tray lined with parchment paper. This is a bit of a delicate job, but I managed with my fingers and a knife. Cover with a damp cloth and let rise again until nearly doubled, between 2-3 hours. Preheat the oven (finally!) to 400F and bake for 20-25 minutes. I had a drip-catching tray underneath, as recommended in the recipe, and that was really good to avoid oven fires or a smoky house. Immediately out of the oven I brushed each with a mix of 1/8 cup melted butter and 1/8 cup cream mixed together. These were divine! Good luck, it’s not the easiest recipe but it is amazingly delicious. Surprise! Welcome to my Northwest Territories Kitchen. 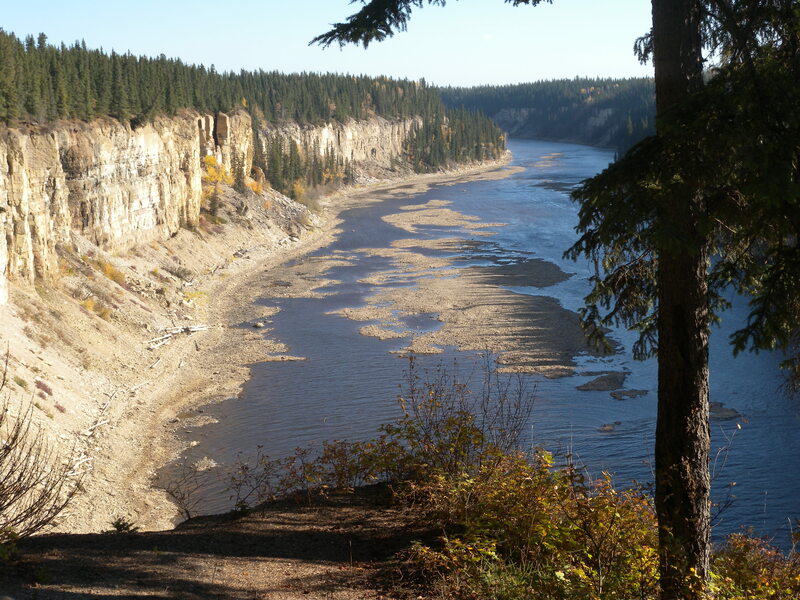 I’ve somehow found a new place to call home, amidst the tail-end of the boreal forest treeline, on the shores of the Great Slave Lake. I think this is going to be a great year for Gourm(eh) on my end – I’ll be exploring Canadian food from the Northern perpective, something I’ve always wanted to do. There are still a few weeks of fishing left (hopefully) before we break until the ice can hold us safely. The rose-hips are lonely without their leaves, just waiting to be picked and turned into jelly. The days are getting shorter at an unbelieveable rate – and although I’ll miss the sun, I’m really excited for the northern lightshow, with a mug of hot chocolate. I’ve been here for a week now, and while I was hoping to share a traditional dish right away, I’m going to start with this tarte la francaise, in hommage to all the wonderful francophone people I’ve met in the community. Without an internet connection of my own, I’m dependent on the public library, and neighbours around me, who have generously offered me their internet connection. Tired of going up to see them for their internet, I decided to pay them back with a warm little apple pie tonight, like my Grandmother makes in Normandy. Make the short crust pastry at least 30 minutes in advance, and refrigerate. Preheat oven to 400f. Slice apples finely with a sharp knife. Dip in a dilute lemon juice solution and drain so they don’t brown. Once oven is ready, roll crust out to 3cm wider diameter than a tart dish (or a pie dish). Place in dish, and press edges down to have a nice thick outer crust. Prick the bottom of the crust with a fork. Freeze for about 10 minutes. 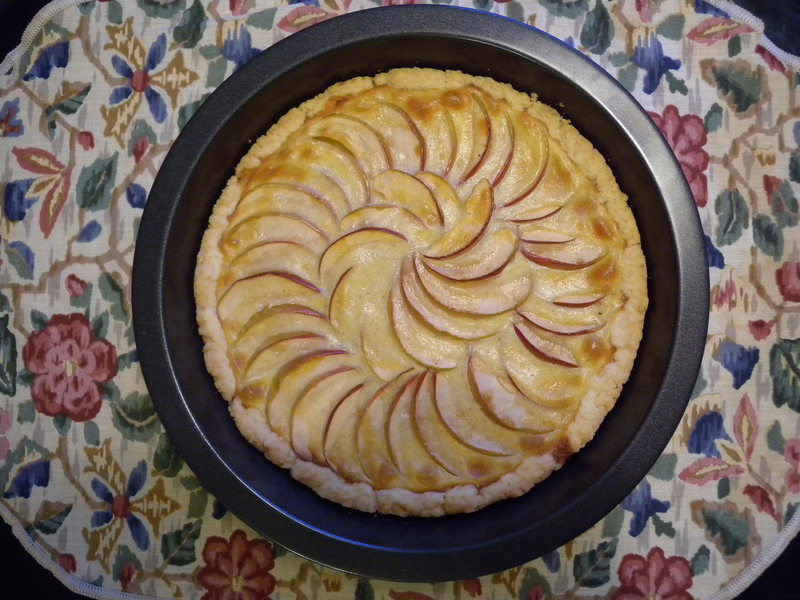 Arrange apples on cooled crust in a thin layer. Bake in oven for 25-30 minutes until apples begin to soften and crust becomes lightly golden on edges. Meanwhile, whisk the cream, egg, sugar, and spices together, and refrigerate until apples are softened. Spoon cream mixture over apples and bake for another 25 minutes or so, or until set and slightly golden. Enjoy with vanilla-infused whipped cream or a scoop of vanilla ice cream! Today is a very special day – 3/14 – the best excuse of the year to make pie! So in honour of pi day, I share below my five favourite pies from last year. May your days be filled with delicious pie! 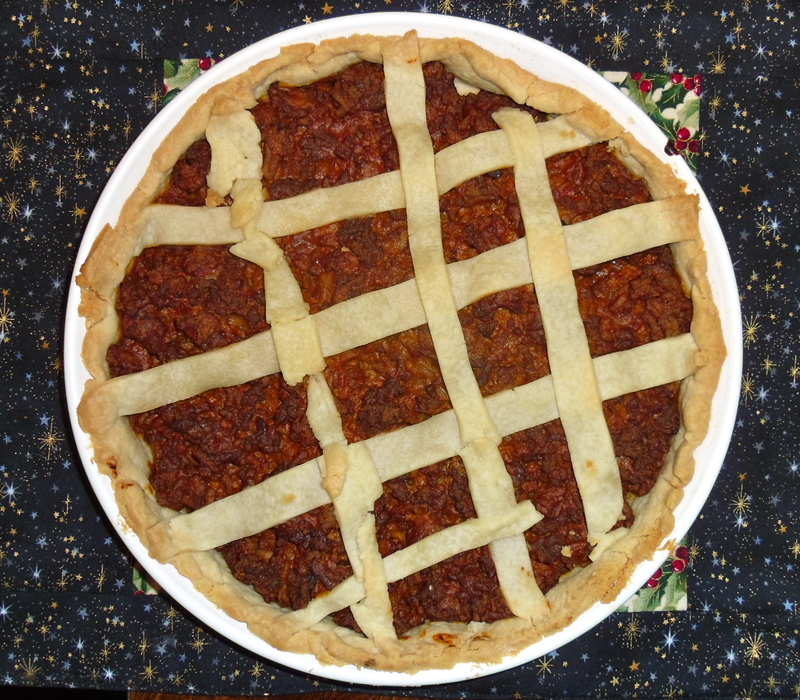 Tourtiere – Easily my favourite savoury pie, this traditional Quebecois meat pie is a treat! White Chocolate Cranberry Tart with Toasted Pistachios – This combination of tart cranberries, nutty pistachios, and smooth chocolate is elegant and stunning. 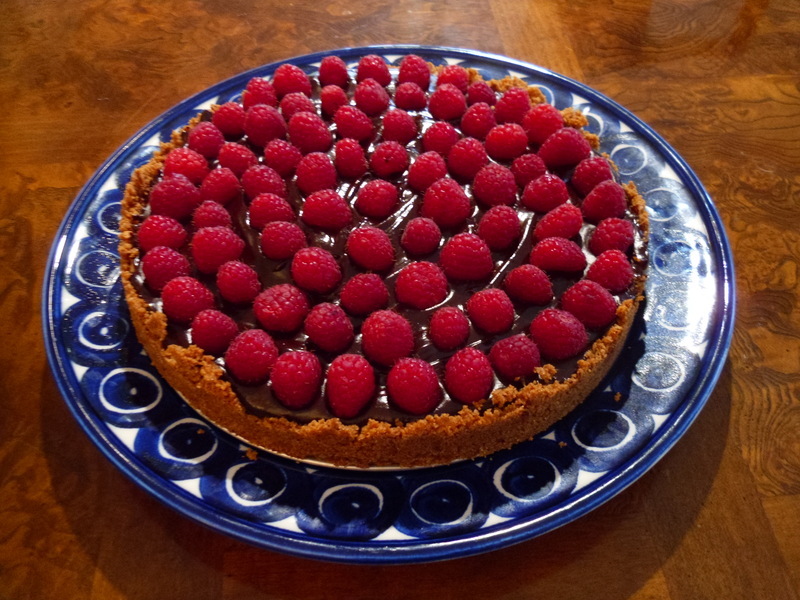 Raspberry Glacee Pie – If you ever need to bribe my mother, look no farther. This delicate raspberry pie is truly divine served with whipped cream. Pumpkin Pie – Nothing screams autumn more than impeccably spiced pumpkin pie. Chocolate Hazelnut Pie – Whipped hazelnut cream filling topped with chocolate ganache. Need I say more? Wishing you a very Happy New Year from Gourm(eh?)! It’s hard to imagine that 2012 has arrived! 2011 has flashed by quicker than either of us expected, and both of us have loved writing entries for gourm(eh?). Neither of us could guess how rewarding this blog would prove to be. We are so grateful for our reader’s supports and comments, and hope you will continue to enjoy our posts in the year ahead! In the meantime, we wanted to share with you our 10 most popular recipes from 2011. 10. Coconut Turnovers – A recipe Sitelle invented while reminiscing about her travels in Belize — these turnovers are mouth wartering. 9. Okra, Potato and Cauliflower Curry – Who doesn’t love Indian food? Madhur Jaffrey spotlights okra is this spicy dish. 8. Pesto Pasta with Caramelized Onions, Roasted Asparagus, and Zucchini – Pesto is a favourite of Catherine’s, and this pasta dish (or a variant) features at least once a month in her kitchen. 7. Mocha Chip Meringue Cake – Our very first gourm(eh?) post! This is a little taste of meringue heaven. 6. Crispy Baked Mac and Cheese – The more cheese, the better in our opinion. 5. Chocolate Zucchini Cake – One of Catherine’s top secret family recipes, she has yet to meet a picky eater who didn’t love this chocolatey, moist cake. 3. Cream of Broccoli and Spinach Soup – Concocted during Catherine’s month of vegetarianism, she’d eat this any day of the week! 2. The ultimate Canadian butter tarts! – We wrote developed gourm(eh?) partially to explore Canadian cuisine. This here is Sitelle’s take of this delicious Canadian treat. 1. Rigatoni with Eggplant and Pine Nut Crunch – The post that saw us freshly pressed (!!!! ), this rich pasta casserole is keeper. You'll devour the pine nut crunch topping! With Christmas lights sparkling on the street, I was recently inspired to make a fancy Christmas desert. It is a truth universally acknowledged that The Three Tarts Bakery makes some of the most divine tarts in Ottawa, and one of my particular favourites is their white chocolate cranberry pistachio tart. This tart recipe, which infuses orange zest in the shortbread crust, looked like it could challenge The Three Tarts’ recipe – both for taste and for prettiness. The added hint of citrus reminded me of oranges in my stocking on Christmas morning, the cranberries of turkey dinner, and the pistachios of eating nuts around a fire. I could not have hoped for a better Christmas desert. 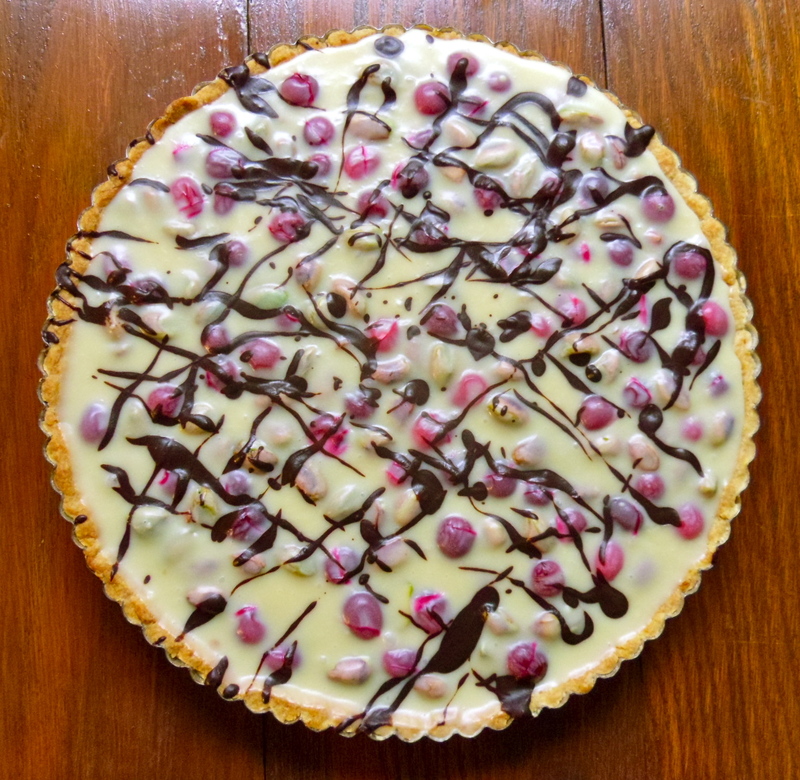 The tart exceeded all expectations: creamy and smooth, the sweetness of the white chocolate was balanced beautifully by the tartness of the cranberries, the nuttiness of the pistachios, and the zestiness of the shortbread crust. I’ll have to find another excuse to make this again over the holidays! Cut the butter into the flour and sugar until the mixture resembles coarse oatmeal. Whist together the egg yolk, whipping cream, and orange zest together, and combine with the flour until the dough clings together. Pat into a disc, wrap, and chill for 30 minutes. Preheat oven to 350 degrees. Roll our tart pastry on a floured surface and transfer to 10 inch tart pan. Trim edges. Cover with parchment paper and weigh down with beans or pastry weights. Bake for 15 minutes, remove the pie weights, and bake for 10 minutes more, or until golden. Remove the tart shell from oven and allow to cool. Shell pistachios and toast if necessary. Blanch cranberries in a large pot of boiling water. Shock the blanched cranberries in an icebath and allow to dry on paper towel. In a small saucepan, bring the cream to a boil. Add the white chocolate, wait a minute, and then stir until incorporated. Add the butter and stir until smooth; avoid over-stirring since it will result in air bubbles in the tart. Randomly scatter the pistachios and cranberries in the tart shell, and carefully pour the white chocolate cream filling overtop until the fruit and nuts are completely covered. You will have a little extra chocolate cream filling left over. Microwave the bittersweet chocolate in a small splash of milk for 45 seconds. Stir until smooth and the chocolate is completely melted. Dribble the dark chocolate over the tart. Refrigerate for at least four hours or overnight. One hour before serving, remove the tart to allow it to soften and enhance the flavours. Cut with a hot dry knife. Although this particular recipe is my own invention, it is based on an idea my mother came up with. And the best part is that it’s more delicious, easier, and more novel than the usual crumble (well, perhaps not after this post – but I’m ok with that). With this dessert, not only do you have the delicious crumble topping and the warm apple, but you also have a flakey crust. 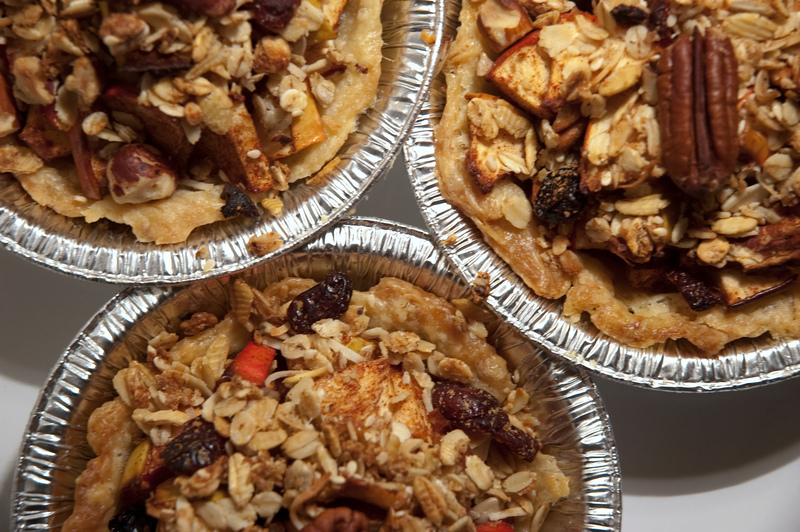 And the trick is that the crumble topping is made primarily with wholesome granola! All the pies I made 20 minutes ago have already vanished – which I take to mean it was a success. In September I moved to Montréal, and I shared these pies with my new house-mates. They were made with apples I picked right off a tree during my lunch break while working in the field at a switch-grass farm. 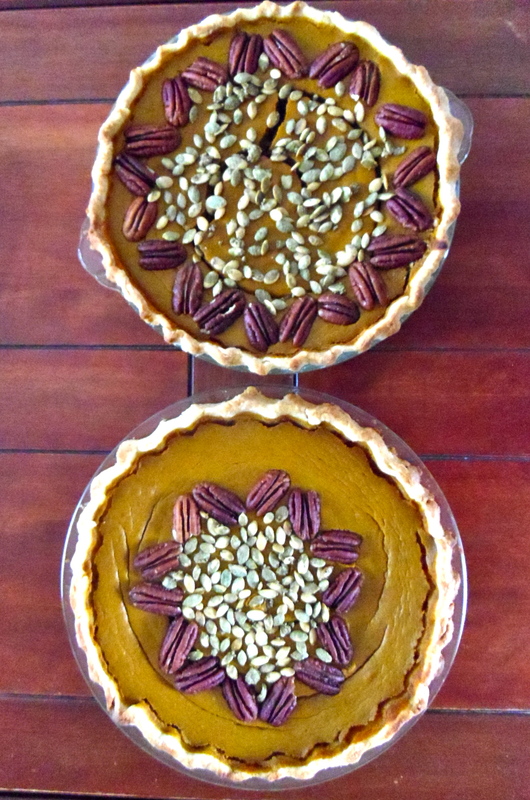 I hope you can enjoy these pies often during the cold winter months! Prepare your sweet shortcrust pastry 30 minutes in advance. Preheat oven to 350. Grease 6 small tart pans (I used the small 4-inch tin pans available at the supermarket). 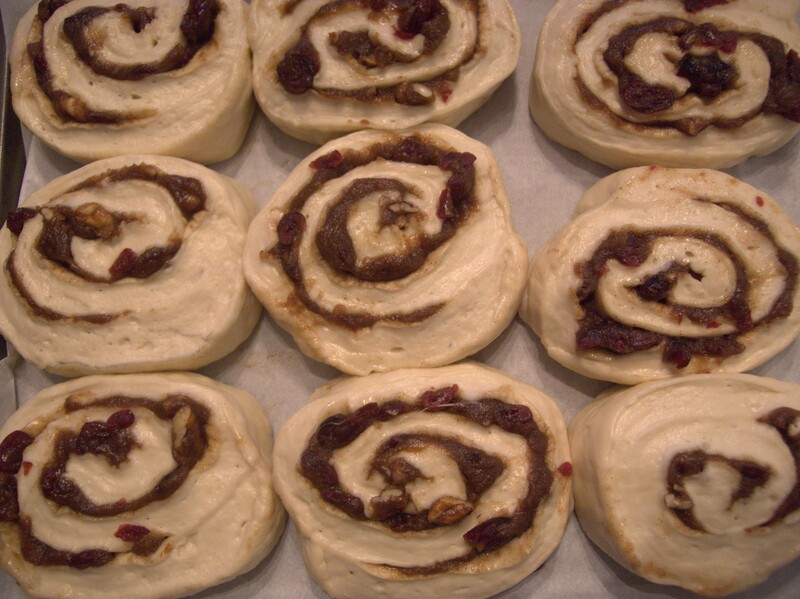 Roll out dough after it has rested, and cut it into 6 circles to fit into the pie shells. Prick the crust on the bottom and sides, then place in the oven for 15 minutes to partially blind-bake it. Meanwhile, crush the pecans into small chunks. Mix with the cinnamon and brown sugar. In a separate bowl, mix the granola, flour, brown sugar, and butter. Once the crusts are set, quickly cut the apples and mix into the brown sugar, pecan, and cinnamon mixture. 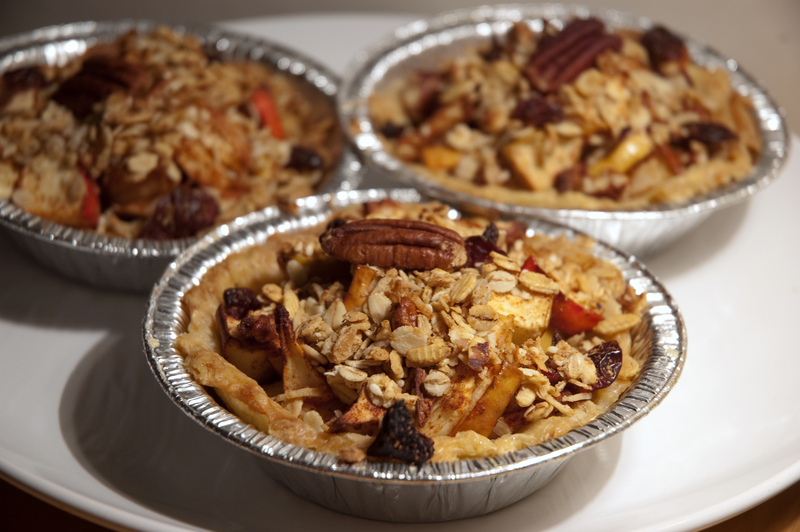 Place 1/6 of the apple mixture in a heaping pile in each pie, then top with the granola topping. Bake for 45 minutes, until the apples are in their melt-in-your-mouth stage. 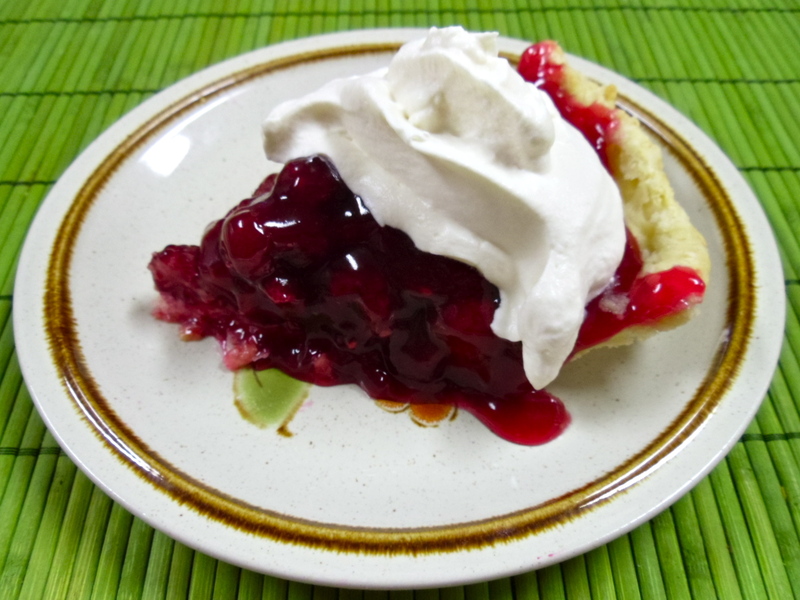 Serve alone, with vanilla yogurt/ice cream, or lightly sweetened whipped cream! This past weekend, my friend Craig came to visit my roomate Katie and me in Halifax. After spending a lovely day wandering the Seaport Market and Spring Garden Road, we were craving flaky and cheesy spanakopita. Unsurprisingly, we ran out of spinach filling before phyllo, so inspired by frozen berries in the freezer, we decided to make bumbleberry tarts. The filling was berrilicious and the tarts crispy. 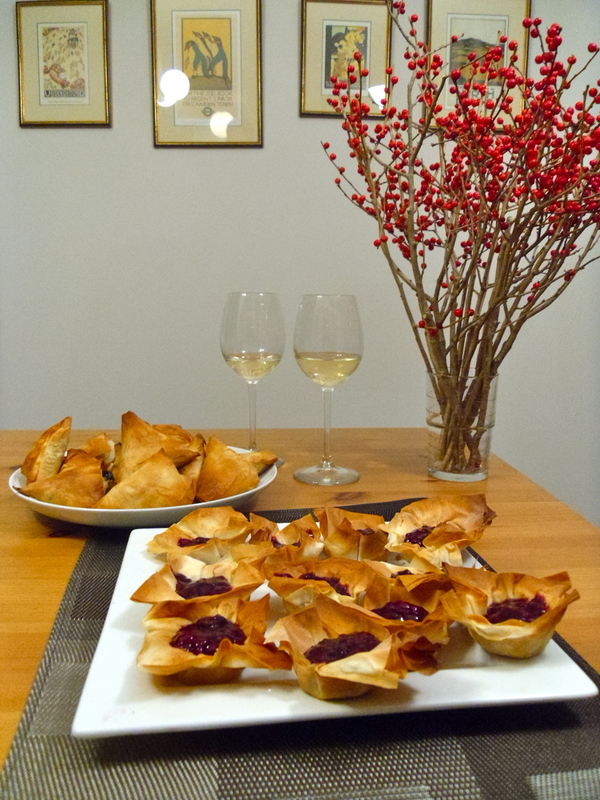 I confess I still have a slight preference for flaky pastry, (or filling the phyllo cups with salmon mousse), but this was a tasty way to ensure we did not waste any phyllo sheets! The phyllo cups can be made a day ahead if once cooled, they are stored in an airtight container. Meanwhile, stir berries, jam, and sugar together. Bring mixture to a boil and simmer for 2-3 minutes. Taste and adjust for your preferred sweetness. In a small cup, mix the cornstarch with some of the berry juice. Whisk into bumbleberry filling and continue to simmer for 3-5 minutes, or until thickened. Grate in as much orange rind as desired. Allow the filling to cool. 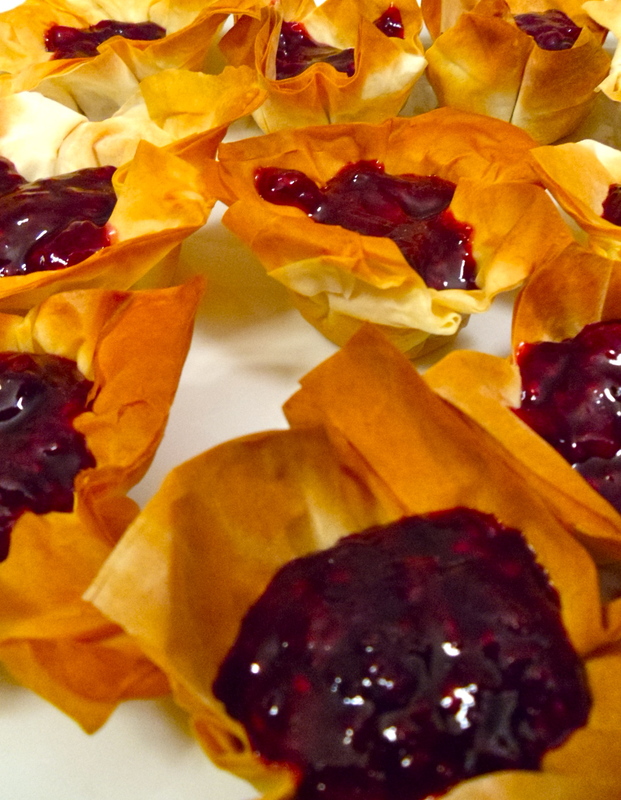 Before serving, spoon the filling into the phyllo cups. Bon appetit!